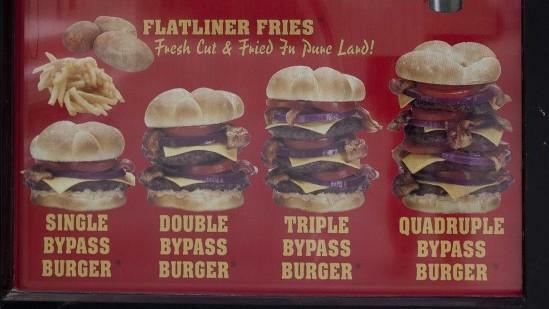 Signs for "Bypass Burgers" and "Flatliner Fries" are seen in the window of the Heart Attack Grill in Las Vegas. A man who suffered a heart attack in the restaurant was wheeled out on a stretcher Saturday. Many in the restaurant — including its owner, "Doctor" Jon Basso, thought the incident might have been a joke. "One of the nurses came back to me and said, 'Dr. Jon, we've got a patient who's in trouble,'" Basso told KVVU Fox5. The ensuing scene was captured on a cellphone video, below. Paramedics were called to the restaurant, and the man was wheeled out of the restaurant on a stretcher. Interest in the story has been huge: the restaurant's website was only sporadically available Thursday morning, and media in Belgium, Spain and Sweden have covered the story, according to notes posted on the restaurant's Facebook page. The customer's name has not been released, but he is reportedly in his 40s. He had been eating a Triple Bypass Burger — or, a sandwich stacked with three patties of beef. He is said to be recovering in a Las Vegas hospital. It's not the first time the Heart Attack Grill has had a brush with death. Last March, a spokesman for the restaurant's original incarnation, in Chandler, Ariz., died at the age of 29. The family of Blair River, who weighed some 575 pounds at the time of his death, said he did not survive a case of pneumonia. That location has since closed, according to Yelp. It's uncertain how the Las Vegas restaurant will deal with this most recent event. Shortly after River's death in 2011, owner Jon Basso was asked by an ABC reporter if he was using the death of his star promoter to garner even more business. "I absolutely agree," he said. "And in a very sick way, his death has gotten the message out further." At the time, ABC reported that Basso had previously "owned a chain of Jenny Craig weight-loss centers, and several personal training studios."